But autocratic regimes misallocate political capital all the time, and plenty have bowed to foreign pressure and lived to tell the tale. Is Iran's Islamic Republic, among the most stable and enduring political systems in the region, so exceptionally feeble that its leaders cannot make a sound decision on this issue without bringing down the house? If political necessity, not odious religious extremism or hegemonic strategic ambitions, obligates Iranian leaders to enrich uranium, where's the push coming from? The answer, implicit in most elaborations of the argument and explicit in some, is the Iranian people. Robert J. Einhorn, formerly then-secretary of state Hillary Clinton's special adviser on nonproliferation, finds "virtually no domestic support at present for what would be seen as gutting the nuclear program or for giving up a future nuclear weapons option." According to Colin Kahl, previously the Obama administration's top Middle East policy official at the Pentagon, "demands that Iran completely dismantle its enrichment program" are viewed by "the majority of the Iranian public...as unacceptable capitulation." 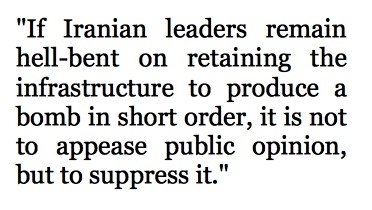 Iranian elites may already be averse to dismantling the program for ideological and strategic reasons, but it is this public opinion barrier that supposedly makes pressuring them further pointless. To be sure, there is some truth to this. Deeply rooted national identity, Shi'ite Muslim religious culture, (understandable) perceptions of historical victimization, and years of regime propaganda appear to have led most Iranians to view their country's nuclear program favorably. But the claim that public opinion prevents Iranian leaders from stepping back from the threshold of producing a nuclear weapon is dubious on several counts. For starters, we don't really know how strongly Iranians support the nuclear program, as public discussion of the matter is heavily circumscribed by the government, and there is no credible public opinion polling about it inside Iran. Survey data from outside organizations is limited and fluctuates wildly depending on who does the polling and how the questions are framed. For example, a May- June 2013 Gallup poll found that 34 percent of the public believes Iran should develop nuclear capabilities "for military use," while a September 2013 Zogby International poll found that two-thirds believe their country should have nuclear weapons. The same Gallup poll reported that 85% of Iranians say sanctions have "personally hurt" their livelihoods, but Zogby found that only 36% "have felt an impact." 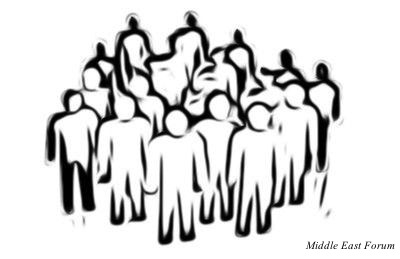 In any case, majority public opinion isn't always politically relevant in the Middle East. The fact that 82% of Egyptians support stoning adulterers doesn't mean their government can't refrain from the practice without prohibitive political costs. Whatever the breadth of public support for Iran's nuclear program, for most Iranians it doesn't appear to be very intense. In the above-mentioned Zogby poll, only 6% of respondents said that continuing Iran's enrichment program was one of their top two policy priorities. Iran's governing elite doesn't seem particularly inclined to do what the people want on plenty of issues they rank higher in importance. Some advocates of compromise argue that elite divisions accentuate the costs of defying public opinion on the nuclear issue. If President Hassan Rouhani makes too many concessions, the reasoning goes, public opposition to the deal will provide "hardliners" with just enough votes to defeat "moderates" at the polls. But there's little evidence that public opinion on the nuclear issue matters a whit even on election day. Those who self-identified as Rouhani supporters in the Zogby poll were more likely to believe Iran should have nuclear weapons (76%) than those who supported his opponents (61%). This isn't to say that a decisive nuclear rollback won't be a public relations challenge for Iranian leaders. After spending tens of billions of dollars on the nuclear program, sacrificing perhaps $100b. more as a result of sanctions to keep it running, and silencing dissenting views, gutting the project is going to be hard to spin. But the suggestion that Iran's governing elite can't stomach presiding over a super-charged post-sanctions economic recovery without spinning centrifuges because of public opinion is absurd, akin to arguing that the pro-Palestinian sympathies of ordinary Iranians prevent their government from ending its sponsorship of anti-Israeli terrorist groups. If Iranian leaders remain hell-bent on retaining the infrastructure to produce a bomb in short order, it is not to appease public opinion, but to suppress it. Once they have achieved internationally recognized nuclear threshold status and normalized relations with the West, they know that the international community will be loath to punish their human rights abuses and systemic violations of political and civil liberties, for fear of provoking a nuclear breakout. Blaming the Iranian people for this state of affairs just adds insult to injury. The author is a Shillman-Ginsberg Fellow at the Middle East Forum.